Originally a 2D fighter, Phantom Breaker: Battle Grounds does a fantastic job of bringing its characters to life in an SNES-esque side-scrolling beat ’em up. It doesn’t try to innovate the genre in any way, but it doesn’t have to, shoving its fun, yet repetitive gameplay in your face. Albeit short, Battle Grounds will have you hooked onto your PS Vita, even if you prefer quick and concise experiences. Enemies you do fight, are taken down using combos, specials, and the weapon that is unique to each character. Regardless of the characters having different weapons, they still share the same button combos. The options menu has some suggestions, or you can make up your own, and see how high you can get the hit meter up to. You’ll find that if you don’t care about highscores, using combos is impracticable, as mashing x is severely over-powered. It makes little sense not to spam the hell out of it, save for certain sticky situations. Characters level up rapidly, which does feels exhilarating, until you realize that levels don’t mean much. The fact that a level 0 characters could take on enemies almost as easily as my maxed out level 50 was pretty ridiculous. What really gravitates you to grind it out with one character is your skill set. Battling gets you skill points that can go towards your attack, defense, speed, and special attacks. It’s all customizable, allowing you to create whatever type of characters you wish. Want your attack and speed up while hitting criticals like it’s nobodies business? Doable. Molding your character after the Seattle Seahawks by maxing out your speed and defense? Please, do. Defense does win championships (aka nightmare difficulty), after all. Skill sets are about as in depth as Battle Grounds gets, so don’t get used to it. Every level has a different background, but is designed similarly. You get two planes to stand in, some enemies stand in the background, and others in the foreground. It was a little tough to get used to, but once in the habit of clicking L to switch, you’ll find how annoying the mechanic can get. It’s just an excuse to fill the screen with enemies, like when two or three of them are left on screen, and they think it’s amusing to switch back and forth to avoid your attacks. Death will be wished upon this game mechanic at that point. There was one stage where it had some potential to challenge you, as two cake-throwing enemies were facing opposite directions, in opposite planes, but it ended up being a spam-fest. Being endlessly knocked down by food was not fun. One of the most frustrating mechanics was not being able to walk freely. Once you cleared a section of its enemies, you’d get automatically moved to the next screen. With there being a ton of enemy drops, mostly benefiting to your overall score, it got to be an inconvenience, quick. It would’ve been a bit better if it only affected those who love to dig at game’s innards to reach the highest score they can, but once it prevented me from picking up health and power-ups, I had a bone to pick with it. The funniest part about this is that when you finally got the chance to go through screens of enemies at your leisure, it ended up being in the worst level of the game. Having the back and foreground covered with designs that matched the background was not fun. I could hardly see the enemies, let alone the loot. There is an online mode, via internet or ad-hoc, but it was impossible to play a match on it. There’s no one on it, I tried late at night, afternoons, and evenings, nothing. Battle Grounds has only been out on PS Vita – in America- for a little over a month, it’s quite sad, actually. Craziest part is that there’s a trophy for completing an online match, honestly, it just makes this situation even more tragic. Despite having short stages, Phantom Breaker: Battle Grounds will have you gaming for a while, there’re 10 characters to level up to 50, not including the DLC which adds an extra while also increasing the level cap. Not to mention the highscore chasing that is to be had. Only about 9,000 are actually registered, so getting to the top should be easier than most games. 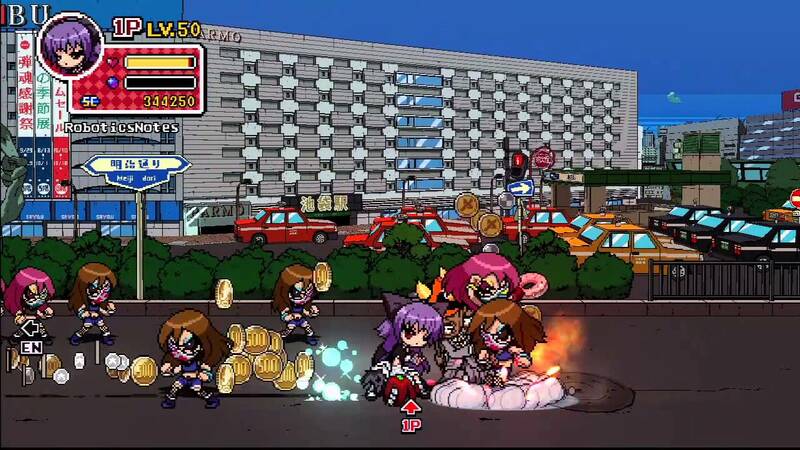 Phantom Breaker: Battle Grounds was made for Vita. It’s perfect for short bursts, but also makes you pour hours into leveling up your bloodthirsty (not really) characters while getting the highest score you can. Anyone can pick the game up and flow right into it, it may be a little on the easy side, but it’s definitely on the fun side as well.